When everyone works together and helps each other out, the world is a beautiful place. Antonio is so proud of his new apartment at 22 Water Street in Cambridge, and was delighted to show off his new place. 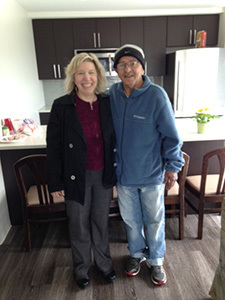 His affordable, secure apartment – and the happy smile on his face – is a result of an effective collaboration between Just-A-Start, the Cambridge Multi-Service Center, Somerville-Cambridge Elder Services, and the City of Cambridge Inclusionary Housing Program. These agencies all worked together to help Antonio avoid becoming homeless. Antonio came to the Northeast from Puerto Rico, with a job in New Haven, Connecticut. In 1985, he moved to Cambridge and finally received an affordable apartment after hitting a rough spot when he lived in a homeless shelter for six months. Antonio is a hardworking, quiet man, and lived in this apartment for 10 years. He had also developed some serious health issues. In May 2015, Antonio’s landlord told him he needed Antonio’s ground floor apartment for his elderly mother and wanted Antonio to move out – and thus, the strained relationship between landlord and tenant began. The Cambridge Multi-Service Center got involved, and then suggested that Antonio work with Gerry Zipser in Just-A-Start’s Housing Services Program, to mediate the situation before it escalated and left Antonio homeless. Gerry started working with Antonio and the landlord and kept the lines of communication open and though the housing search process moved more slowly than anticipated, the landlord agreed to let Antonio stay until his new apartment came through. JAS also helped Antonio clear-up a credit report problem that initially prevented him from being accepted for new apartments. Antonio was able to move into his new place on February 1st! “When everyone works together and helps each other out, the world is a beautiful place. Things happen for the best! I can’t believe how wonderful my new apartment is and how lucky I am to have met Gerry”, exclaims Antonio. Although he still receives dialysis three times/week, and is on a kidney transplant list, Antonio’s health is improving and he is looking forward to having a visit from his family in Florida. JAS’s innovative model for stabilizing housing through the combination of conflict resolution, legal education, and emergency rental assistance has proven effective in assisting 413 households in 2015.